For centuries, real estate has been a proven vehicle for investors to earn both. Whether or not you can make the live event, everyone who registers will be emailed a replay video of the event once it ends. So you'll be able to watch, pause & re-watch it as many times as you like to capture all of the insights. We also encourage you to have your family watch, too -- the benefits of real estate investing compound the earlier in life you get started! 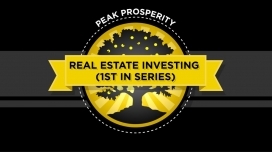 Presenters Russell Gray and Robert Helms (aka "The Real Estate Guys") have been educating people from all backgrounds on the process of successful real estate investing for decades. In this webinar series, you are getting their best material, honed from many years of experience of what works best. Those participating in the live webinars have the ability to interact directly with the expert speakers, as well as to submit their own personal questions to be addressed. While we can't promise *every* question will receive an answer, we make our absolute best attempt to do so! And while many markets are overvalued today, when the next (and in our opinion, long overdue) market correction hits, it'll be the savvy investors who positioned themselves wisely in advance who will score great values at much lower prices. ""I was able to participate in the first RE webinar sponsored by PP and The Real Estate Guys, and it was really outstanding: a very informative and valuable two-hours. While this first one was provided at no charge to participants, the cost for future webinars is a very modest $50 for content that others pay hundred$ for. Having unlimited access to the slides and recorded sessions for re-viewing and to share with others, AND the 20% discount off of future PP RE webinars makes this an awesome deal! Many thanks to Chris, Adam and The Real Estate Guys Russ and Robert, for pulling this together for the PP tribe. :)""
WILL IT BE WORTH IT?